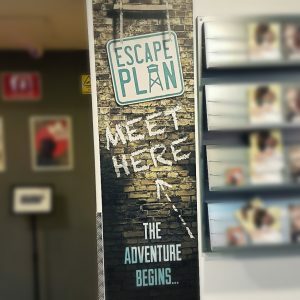 Last night I got to try out on of the Escape Plan rooms in Shoreditch, through Love Popups London. Along with JoJoExplora and Jamie, I headed to RichMix near Shoreditch High Street to play this fun puzzle game. Once Carlos, our game host, collected us from the reception area, we headed straight down to the escape room, which has a secure place to store all our belongings, right outside the barracks doors. We received a short overview and introduction, which we kept interrupting for questions and comments as we are that kind of team, confusing poor Carlos a bit in the process. But we felt confident going in and nothing of importance seems to have been missed as we made good progress from the start. As there were only three of us, we were unsure how well we would do with this quest, but everything made sense, puzzles were logically arranged and the diary gave us everything we needed to know what to do. There are so many things to find and work out, we definitely were kept busy! While a dictionary was provided, I was for the first time in an escape room in England, able to use my native tongue to help us along as a few things were written in German and needed to be translated. 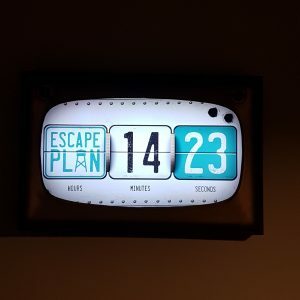 We had a lot of fun with Escape Plan, barely needed any nudging along, and made it out with over 14 minutes to spare. I’d definitely recommend this room to newbies and veterans alike, it has a great flow and many fun puzzles to work on with some innovate things that I haven’t ever seen in other escape experiences before. And they took great care to make everything fit the 1940s theme as well!